Welcome to the next era of Western Civilization! First Degree The D.E. and friends (San Quinn, Bee Gee, and more) have made it their mission to bring back real rap! "FU4" is the way rap is supposed to sound! This album features the hilarious single "Lynch Roast", clowning First Degree's ex-partner in rhyme Brotha Lynch Hung, and is co-produced by Phonk Beta and Oji El. 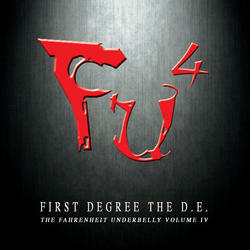 First Degree has participated in many interviews promoting the "FU4" movement. "We are Sactown's reckoning!" "FU4" is the future of rap, prepare yourselves.